The No Way to Treat a Child campaign seeks to challenge Israel’s prolonged military occupation of Palestinians by exposing widespread and systematic ill-treatment of Palestinian children in the Israeli military detention system. No Way to Treat a Child is a joint project of Defense for Children – Palestine and American Friends Service Committee. 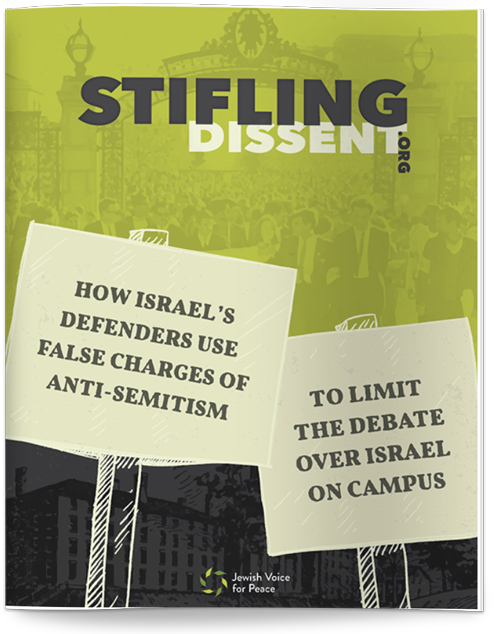 This white paper was recently published by Jewish Voice for Peace, documenting, in their terms, “How Israel’s defenders use false charges of anti-Semitism to limit the debate over Israel on campus.” Read the full paper here: Stifling Dissent.